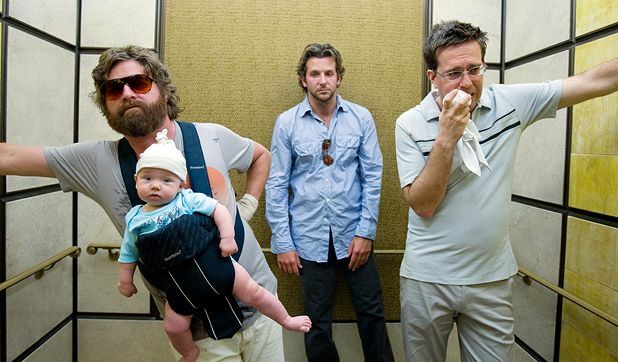 It’s worth toasting The Hangover as one of the Hollywood comedies of the year. Todd Phillips’ film is a buddy movie that really delivers with its riotous cocktail of memorable characters, outrageous situations and explicit humour. Two days before his wedding, Doug (Justin Bartha) heads to Vegas with best friends Phil (Bradley Cooper) and Stu (Ed Helms) and future brother-in-law Alan (Zach Galifianakis) for a final bachelor blow out. Waking up the next morning, however, Phil, Stu and Alan have no recollection of what happened the night before or, more importantly, where they might have left Doug. Phillips is no stranger to the buddy comedy having previously directed Road Trip and Old School but with The Hangover he really excels. Piecing together all of the elements is fun and often genuinely surprising, while the camaraderie that exists between his principal cast is second to none. All three make their mark and Galifianakis’ ‘fat Jesus’ is particularly fine . The appeal and danger of Vegas is vividly captured by Lawrence Sher’s eye catching cinematography, while Jon Lucas and Scott Moore’s script is almost always on the money – no mean feat for a duo whose past efforts include the lamentable Ghosts of Girlfriends Past and Four Christmases. What’s more, the film cleverly stays real enough to appeal to anyone who’s ever endured a fuzzy morning after the night before, while simultaneously existing in its heightened state of comedy. General release from Fri 12 Jun.